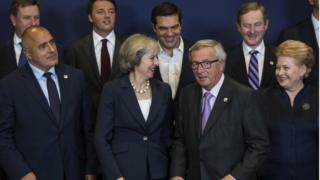 You can't blame Theresa May if she was suffering from some first day nerves as she took her place in the so-called "family photo" line-up of European leaders, looking slightly awkward. Frankly, British prime ministers and governments have often found it hard to slot in. And since the referendum, what has always been a tricky relationship has taken on new layers of complexity, upset and uncertainty too. There will be no significant discussions about how we leave the European Union, no digging through the details. Leader after leader made that perfectly clear as they stepped out of their shiny black BMWs, arriving at the summit on Thursday afternoon. Even if Theresa May had made up her mind, and persuaded the cabinet to do the same - which, remember, is a long way off - European leaders will not engage in much more than small talk until the technical legal process has begun. Image caption Francois Hollande said negotiations would be "hard" - if the UK wanted a "hard Brexit"
And there is not much appetite for making it easy either. As French President Francois Hollande, with a stinging Gallic shrug, said: If Theresa May wants a "hard Brexit", the negotiations "will be hard". He, of course is in rather a lot of trouble at home, so perhaps, just perhaps, sounding off about something else could provide a useful domestic distraction. Of course, Number 10 hopes to build up the vital relationships here, to turn the pleasantries into meaningful exchanges. But Theresa May's first summit here as prime minister was not a day for details, let alone decisions. But to dismiss it would be to miss the political point. Theresa May finds herself in a weird political twilight zone. She's been keen to reassure EU leaders on Thursday, particularly after the febrile atmosphere of the Tory conference, that Britain is - today, tomorrow and after Brexit - a dependable ally. Whatever was said on the fringes in Birmingham, her decision to talk immediately about the importance of Europe taking a strong united approach on Russia, is a signal that she wants her counterparts to believe that Britain isn't just in a headlong rush to the exit door, and won't crash out of the union in chaos. Her desire for what Number 10 call a "smooth Brexit" is designed to reassure. How many of her counterparts believe that's remotely possible, is a rather different question. Watching her meet and greet the other EU leaders was seeing a leader go through the familiar political choreography. Tony Blair always seemed to try to "work" the whole room, like the host at a weird cocktail party where the guests weren't really friends. Gordon Brown seemed to opt to engage intently with a favoured serious few. David Cameron often appeared to try to get as close as possible to the influential others, often cracking a few jokes, performing for the cameras, as he settled down to business. Watching Theresa May press the flesh in her more formal way, I was struck that she believes she will be the last British prime minister to do so, and unless something extremely unexpected happens, that will come to pass. And that's why today matters. We're seeing the first few encounters in a political relationship that will shape her future, and of course, all of ours.